Levis Ivie, age 90 of Commerce, passed away on Monday, November 12, 2018. 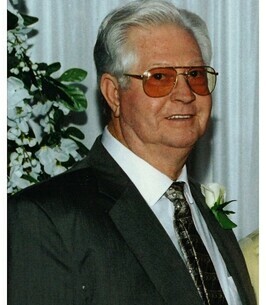 Born in Cornelia, Georgia on July 8, 1928, he was a son of the late Taft and Maybelle Erwin Ivie. Mr. Ivie retired from maintenance with Fieldale Farm Corp. after many years of service. He enjoyed farming, especially his Tuff Bilt Tractors, loved woodworking, and was a faithful member of The Torch Worship Center. In addition to his parents, he was preceded in death by his first wife, Lenolia Taylor Ivie; brother, Donald Ivie, and sister, Sandra Horne. Surviving are his wife, Betty Beck Ivie of Commerce; sons, Dale & Brenda Ivie of Cornelia and Ricky & Doris Ivie of Lawrencevile; daughter, Wanda Gale & Harold Shedd of Kingsland; step sons, Mike & Cindy Faulkner of Kennesaw and Phil & Laura Faulkner of Alpharetta; sister, Charlotte McConnell of Cornelia; 7 grandchildren; 3 step grandchildren; 15 great-grandchildren; 4 step great-grandchildren; 7 great-great grandchildren. Funeral services are scheduled for 2:00 p.m. Wednesday, November 14, 2018 at The Torch Worship Center with Pastor Mike Franklin officiating. Interment will follow in Yonah Memorial Gardens. The family will receive friends from 2-4 & 6-8 pm on Tuesday at the funeral home. To plant a tree in memory of Levis Ivie, please visit our Heartfelt Sympathies Store. We encourage you to share any memorable photos or stories about Levis. All tributes placed on and purchased through this memorial website will remain on in perpetuity for future generations. We are so sorry for your loss. Mr. Ivie was a great man. He will be truly missed. Our prayer are with the family. Love yall. So Sorry to hear about Levis!! He was a Special Cousin!! Sorry we won't be able to be there but Danny just had knee surgery and he can't get out!! Our Love and Prayers to all of you! !